Originally Green Sprouting Broccoli is thought to have been introduced into Western vegetable gardens by Italian immigrants in the 1880's. Italian Green Sprouting Broccoli was later introduced to the seed trade between 1914-1918 and has remained very popular with gardeners ever since. This lovely, old fashioned Broccoli variety is a very disease resistant, very hardy and very prolific producer of large dark green heads. The 7 to 15cm (3 to 6in) heads have a bluish green centre and are typically uniform in size and shape. Italian Green Sprouting Broccoli will produce a number of good-size side shoots once the initial head is harvested. Very easy to grow, plants grow erect and leafy, 75 to 90cm (30 to 36in) in height. This is an excellent autumn crop for cold climates that can be used either fresh or frozen. Matures in approximately 60 to 80 days. Although the heads of this Broccoli variety are typically the only thing utilised, the stalks, buds and leaves are also edible. 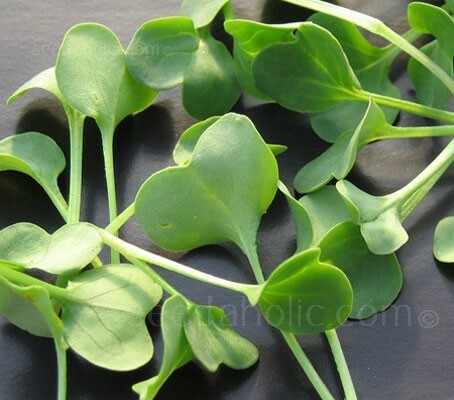 Try growing a few seed to just Micro-leaf stage, (similar to how we used to grow cress), harvest with scissors when they have formed their first leaves and add simply add to brown bread and butter or to a pasta dish. They are very tender with an astonishing clarity of flavour…. a true 'superfood'. Supermarkets have helped to confuse the issue of what is broccoli and what is a calabrese by calling both by either name. Most ‘Broccoli’ sold in the supermarkets is actually Calabrese not broccoli. Broccoli has small heads (mainly purple, sometimes white or green) which mature slowly and can occupy the ground for almost a year. (The word broccoli means 'little sprouts' in Italian). Calabrese are smaller plants that produce larger crowns. Keep in mind is that broccoli is an over wintered crop but calabrese produces its crop the same year before winter. Sprouting broccoli can be harvested from late winter to late spring. Calabrese can be harvested from mid-summer to mid-autumn. If you grow both calabrese and sprouting broccoli, your kitchen will be kept in broccoli for most of the year. To add to the confusion, this variety, called "Italian Green Sprouting" is a "heading" broccoli. The name refers to the multitude of sprouts it produces once the main head is harvested. Start digging over your soil in autumn, removing any stones you find and working in plenty of well-rotted manure or compost. Tread on the soil to remove any air pockets and make the surface very firm. Brassicas will fail if the soil is too acidic so add lime to the soil if necessary, aiming for a pH of 6.5. Sow early and you will miss the first caterpillars. Early crops can be enhanced with the aid of crop covers. Plants should be spaced 30cm (12in) in all directions. Lower crop density gives a longer period of harvest, as more secondary heads are produced. Expected germination time 7 to 12 days, depending on soil temperature. To get an early crop in June, sow under cover in modules or sow in a seed bed outside from mid to late March until the end of May. Plant out in April with fleece protection. (It dislikes bare-root transplanting). After a few months, when your seedlings reach 6 and 8cm high (2½ -3in), they're ready to plant outside. Water the day before moving, and keep well-watered until established. Space plants at least 30cm (12in) apart and make sure you dig a good deep drill (2.5cm) to give them good anchorage. Seeds can be sown direct in April to June. Sow seeds thinly about 12mm (½in) deep. Sow thinly, as this reduces the amount of future thinning necessary and potential risk from pests. Broccoli calabrese is one of the most successful winter crops for a walk in polytunnel. Sow a few seeds in modules every six weeks from March to August and plant a short row when there’s room. In September and August, sow a few seeds directly and thin to 30cm (12 in) apart. Leave them to grow undisturbed through the winter. Autumn sown crops will be ready to pick in March to June. Harvest: Late winter to late spring. The heads must be cut whilst in tight bud; once per week in cool weather, twice a week is essential in warm weather, as this encourages the side shoots to develop quickly. Use a sharp knife and leave a small stalk. Pick the side-shoots regularly (when about 10cm (4in) long. Regular picking can extend cropping time for up to eight weeks. Don't get carried away and strip plants entirely in one go. Steam rather than boil to keep their rich colour and vitamin count. Leaves also can be cooked and eaten as a winter green. Fresh florets will keep in the fridge for around a week but are also great frozen. Broccoli is one of the few vegetables to skyrocket in popularity in recent years, mainly because of announcements by medical research groups that eating such cruciferous vegetables as broccoli helps significantly to reduce the risk of cancers. Rotate your crops, planting brassicas, of any kinds, in the same ground more often than once every four years runs the risk of club root infestation and once you have it, the ground is useless for up to a decade. Don't take needless chances, even with "catch crops" of radishes. Broccoli evolved from a wild cabbage plant on the continent of Europe. Indications point to the vegetable's being known 2,000 years ago. Broccoli grew wild on the shores of the Mediterranean sea and since the Roman Empire has been considered a uniquely valuable food among Italians. It can be traced to France in the 1500s, England in the mid-18th century and began to be cultivated commercially in the United States in the 1930s. 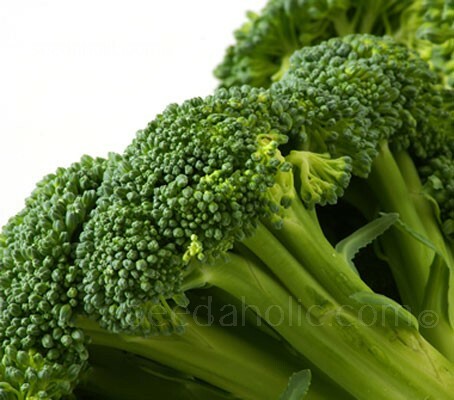 Because broccoli was developed in Italy, the plant was named by botanists as Brassica oleracea variety italica. The word broccoli is from the Italian plural of broccolo, meaning 'little sprouts' in Italian referring to the flowering top of a cabbage. The large heading varieties of broccoli are sometimes named calabrese after the region of Calabria in Italy. Broccoli is the leading member of the nutritious cruciferous family of vegetables, so named for their cross shaped blossoms. Firm, fertile, free-draining but water-retentive soil. 7 to 12 days, depending on soil temperature.